Spelt, one of the oldest cultivated grains, is a healthy pasta superstar: rich in fibre, vitamins and proteins, and well-tolerated by many gluten sensitive people. 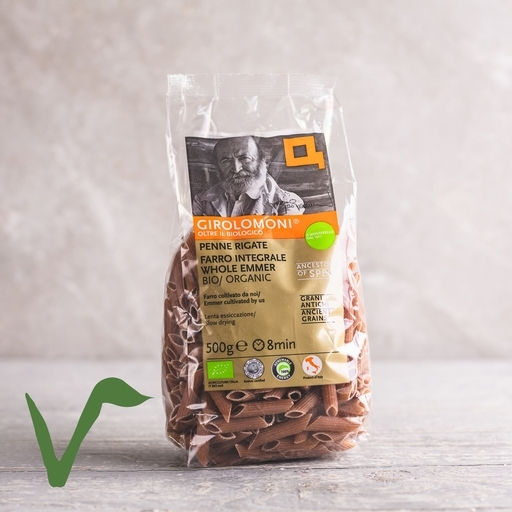 This Italian pasta is shaped using traditional bronze dies for a rough surface that holds on to sauces and seasoning, and dried slowly to preserve its deep, nutty flavour. Spelt penne cooks in 7-10 minutes. Eat with broad beans, mint and bacon for a quick summery dish, or with spinach and ricotta for something more creamy and comforting. It also holds up well in stews, like this beef and squash hot pot. Wholemeal pasta contains natural oils that mean it’ll go bad quicker than white pasta. Keep it somewhere cool and dry and eat it within a few months. Whole emmer wheat flour (triticum dicoccum).